PELUM Kenya in collaboration with the Busia County, joined the rest of the World in celebrating the World Food Day on the 16th October 2017 through its Green Action Week campaigns. Green Action Week is a global campaign whose aim is to raise consumer awareness on organic food and farming. The celebrations were held at Amukura market, Busia County and were led by the Busia County Executive Committee Member for Agriculture and Animal Resources Dr Moses Osia. The theme for the celebrations was: Organic Food and Farming for All. 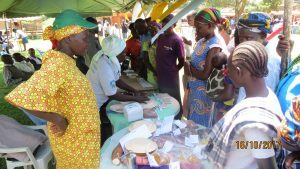 The event was attended by over 400 members of the public including County and sub-County officials, Small holder farmers, media practioners, Civil society organizations among them PELUM Kenya Member Organizations. 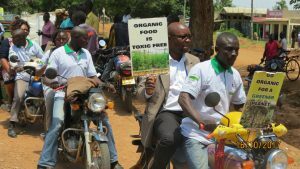 The event included a peaceful demonstrations appealing to the members of public to embrace organic food and farming and exhibitions by farmers and different stakeholders on organic food and farming. Speaking during the World Food Day at Amukura market in Teso South, Busia County Executive Committee Member for Agriculture and Animal Resources Dr Moses Osia said although Busia produces 600,000 bags of maize per year compared to 200,000 of sorghum and millet, it is not the only food to be consumed, thus the need to diversify.” We need to take agriculture as commercial farming to stop the culture of the youth selling their land in rural areas to look for white collar jobs in urban areas instead of utilizing the land to produce traditional foods that are fast income generating,” he said. He also urged the residents to embrace organic farming as it is environmentally friendly.